Bournemouth International Airport has plenty of parking facilities for its passengers, and a current expansion project is increasing the number of spaces. There are currently enough spaces to accommodate 1,500 vehicles. Visitors take a ticket on arrival and then pay with cash or credit card outside the Arrivals hall before leaving. drivers who are only parking at the airport for a short time can use Car Park 3 near the terminal entrance. This parking lot is ideal for seeing off or picking up passengers. The initial 10 minutes of parking are free, after which the charge is calculated by the hour. drivers who plan to leave their car at the airport for more than an hour or two can make use of car parks 1 and 2. Car Park 2 is north of the terminal, while Car Park 1 is closer to the front entrance. Both are much cheaper than Car Park 3. The best rates are available for two- to five-day periods. Bournemouth Airport also offers valet parking and chauffeur services. These are best arranged ahead of time through pre-booking services. Staff will meet you at the passenger drop-off spot outside of check-in and take your vehicle to the appropriate car park. disabled passengers with special needs will find dedicated parking facilities in Car Park 1. Wide parking spaces with easy access to ramps and lifts are found here, close to the front door. Cars parked in these spots must display a valid disabled persons' badge on their windscreen. many visitors to Bournemouth choose to hire a car during their visit. Getting to the city centre is straightforward, and travellers can easily explore the surrounding countryside. 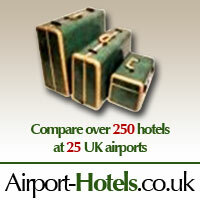 The following three car hire firms have offices in Bournemouth Airport: Alamo, Budget and Hertz. 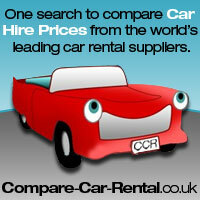 The best car hire deals are available to those who make an advance online booking.